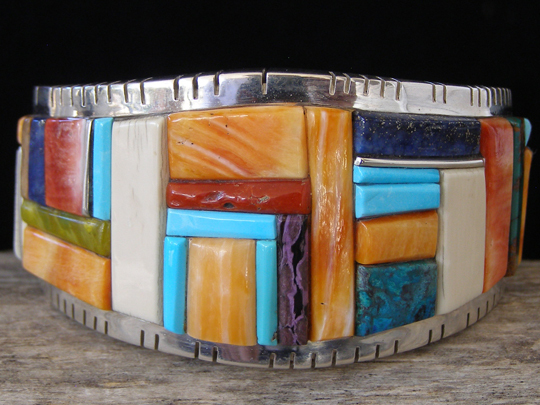 David Tune Multi-Colored Inlay Bracelet size 5 1/2"
David Tune is an established inlay artist who has received multiple awards during his long career. This is gorgeous work which combines a wide variety of fine materials beautifully inlaid in the thick Sterling foundation. David used a jeweler's jigsaw to decoratively notch the edges of the cuff. The inlay work consists of carefully hand-cut pieces of Kingman turquoise, fossilized walrus ivory, Mediterranean red coral, red & orange spiny oyster, lapis lazuli, green serpentine and sugilite. Impeccably made by a master craftsman. This bracelet cannot be altered in size. You must measure your wrist (with a tailor's tape measure) to know if this will fit. If your wrist measures 5 3/8", 5 1/2" or 5 5/8", this will be just right for you. Hallmarked DAVID TUNE with a pictographic sun. Width of cuff in front: 1 3/8"
Width of cuff at terminals: 11/16"